How can it be that the “richest Jew in the world” can buy the foreign policy of a major party’s presidential contender and “the Jews” have somehow escaped the blame? If a Jew-hater somewhere, inspired perhaps by The Protocols of the Elders of Zion, sought to invent an individual who symbolizes almost all the anti-Semitic clichés that have dogged the Jewish people throughout history, he could hardly come up with a character more perfect than Sheldon Adelson. Think about it. Adelson, who likes to brag, “You know, I am the richest Jew in the world,” is a gambling magnate who is reported to be under criminal investigation for official bribery and has been accused of having widespread ties to organized crime, including the use of prostitution for his business interests. He is openly deploying his $22 billion fortune to pervert our democracy on behalf of what he believes to be the best interests of Israel, which he defines as an endless war by the Jewish state against its adversaries, with America offering its unquestioning support. 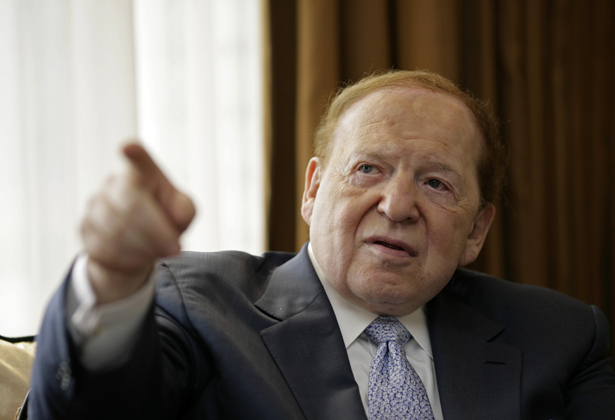 When it comes to Israel, Adelson is as hawkish as they come. He told the Jewish Week, “The two-state solution is a stepping stone for the destruction of Israel and the Jewish people.” He withdrew his financial support to then–Israeli Prime Minister Ehud Olmert when the latter became serious about peace negotiations. He even found AIPAC a bit wishy-washy for his taste and cut it off, as well. Significantly, he remains a big supporter of Bibi Netanyahu, and has gone so far as to fund a free Fox News–style Israeli newspaper devoted to cheerleading for his right-wing policies and attacking all who disagree. In the United States, Adelson owes his recent prominence to the roughly $10 million he and his wife have contributed to Newt Gingrich’s kamikaze presidential campaign. While Adelson no doubt shares some views on domestic policy with Gingrich, including possibly his barely concealed racist hatemongering against the man he calls the “food stamp president,” among others, it is on Middle East policy where the two have really bonded. During the current campaign, for instance, Gingrich has referred to the Palestinians as an “invented” people who “had a chance to go many places” but presumably preferred a life of military occupation. He has endorsed Israel’s illegal seizure of Palestinian land in Jerusalem and elsewhere—contrary to Netanyahu’s promises to refrain from doing so—and refers to a possible Israeli attack on Iran as “an act of self-defense,” suggesting that the United States should do all it can to help. should be blocked by Washington even if that requires employing financial or other leverage to compel the Israeli government to behave reasonably on the issue of settlements. It is vital to our credibility in the entire Middle East that we insist on an end to Israeli expansionism. It is vital to our humanitarian duty to the Palestinian people that we protect the weaker party from the stronger power. It is vital that the world sees that our total support for Israeli security is not matched by a one-sided support for more extreme Israeli territorial goals. It is at least theoretically possible that Gingrich’s 180-degree reversal on Israel/Palestine has nothing to do with the tens of millions of dollars that Adelson might make available to fund his future. Then again, it could hardly have escaped Newt’s notice that without the Adelson millions, he’d have had bubkes in his campaign kitty with which to beat up on Bain Capital. It’s not as if the Adelson/Gingrich relationship has escaped scrutiny in the media or even editorial condemnation. But virtually all the attention has focused on the ability of any wealthy individual to exploit the post–Citizens United landscape for his own agenda. Nobody has noted—at least not in public—that the agenda in question happens to be the one to which Jews accused of “dual loyalty” or of being “Israel-firsters” are alleged to have dedicated themselves. How can it be that the self-proclaimed “richest Jew in the world” can buy the foreign policy of a major party’s potential presidential candidate on behalf of a vision of endless Israeli aggression—up to and including US support for yet another potentially disastrous pre-emptive attack—and the historically abused entity of “the Jews” has somehow escaped the blame? Don’t get me wrong. While I lack sympathy for pretty much everything Adelson and Gingrich seek to accomplish, I am unabashedly thrilled that the bugaboo of anti-Semitic accusation is almost nowhere to be found. But given the near-complete disappearance of this once wholly respectable American prejudice, one must ask why so many organizations in the American Jewish community—along with their neoconservative allies in the media and policy world—remain so intently focused on this problem. Is it that the past has left them so psychologically invested in a now-discredited discourse that they lack the ability to see reality for what it is and devote themselves to more worthy causes? Or do at least some of them, as I implied in my last column, find the accusation so politically useful against Israel’s critics that they prefer to level this nefarious accusation rather than argue the merits of their position?